I finally feel like my brain has turned back on. As of this afternoon, after a lunch of turkey sausage and celery, it's like the bulb went back on instead of flickering on and off like it's been the past four days. I think my brain was fried from extreme stress. I wish I could tell you what was/is going on with one of my kids; then you'd understand. But I respect his privacy so I won't say more. I think anyone would lose it dealing with this kind of thing. The last time I was this stressed was back when I had the cervical cancer scare with a LEEP surgery. Yikes. Talk about stress. I guess it is a natural response to stress, but I hate the feeling that I am not running on all cylinders and my brain is shorting out! The migraines were awful and there was a recall on Excedrin this week, meaning I had nothing in the house that I could take to quell the pain. I am much better now, no pain medicine needed! Scale still says 200. I think my body likes to get stuck here for some reason. Throw it all in the crock pot, give it a stir, and cook it all day on low. I give mine a stir halfway through cooking. Add sea salt to taste at the end. Partially puree with a stick blender if you like a thicker texture. Yummy, soothing, nourishing, and not as high in carbs as I had imagined. This even fits into my plan B and allows me to keep my calories and carbs low. The sun is shining outside and that brightens my mood even more! And now I am going to watch my daughter practice ballet and help my son with algebra while the old dog naps and the pup chews her bone. Enjoy your weekend.. I'm glad your feeling better.. There's not much harder, more fear-provoking, and heart-aching than our kids having trouble. The older they are, the more helpless we feel. Tough stuff. And, yes, the brain shuts down as a self-protective response. People often describe it as feeling as though they were drugged. Nice to hear the lift in your spirits. Came by to see how you were Lyn. Sorry about your son's circumstance and I completely understand respecting his privacy. You are doing awesome! I heart lentil soup. Lentils rock. I'm keeping you in my thoughts this weekend. :( Sorry you're going through all this stress, but glad your headache went away. I hope the stress lessens soon. So sorry to hear about the stress of your son's situation. 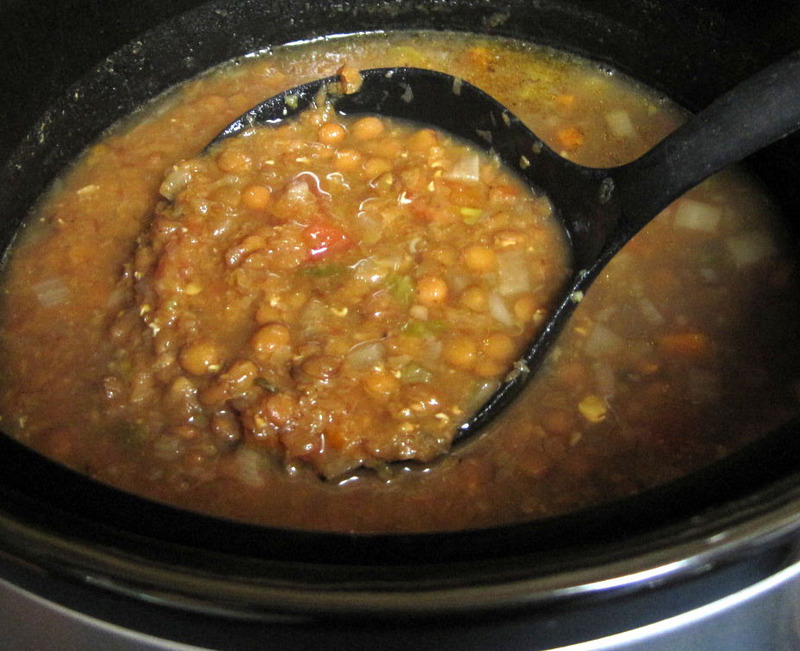 Your lentil soup looks delicious!